Using the Swansea Council’s Urban Development Plan Maps of 2008, the Swansea Canal Society and the Swansea Community Boat Trust organised a walk along the proposed (and currently protected) new route of the Swansea Canal from Llansamlet to Ynystawe. 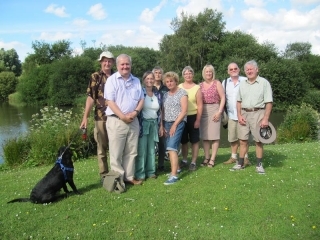 We were pleased to be joined by three local councillors who gave up their time to walk with us. Councillor Ryland Doyle is the Cabinet Member for Target Areas as well as being a Llansamlet councillor; Cllr. Uta Clay also represents Llansamlet, while Cllr. Andrea Lewis is a councillor in the Morriston ward. We met alongside the Fendrod River in Clarion Close, Llansamlet. This river, from its confluence with the River Tawe just south of the Fendrod Lake, will be the new route of the Swansea Canal. From Clarion Close bridge we could look south to the Dylan Thomas pub which the Fendrod passes on its slow way down to the Fendrod Lake. We set off to the north along the river which is a rural oasis in the Llansamlet Industrial Estate. It becomes even prettier when it becomes part of the Swansea Vale Nature Reserve. We must liaise very closely with all local conservation bodies to ensure that any future canal does not adversely affect the wonderful wildlife here. On the banks of the Nature Reserve Lake we stopped for a photo (above). The M4 is a large obstacle to get a new canal under so the protected route of the new canal has to veer away from the Fendrod just south of the motorway towards Mill Stream Way and the Menzies warehouse. The route then skirts the River Tawe before using the bridge under the railway line and the M4 to get to Garth Road, Ynystawe. We walked along this road which the canal will closely follow up to the Ynys Tanglws Bridge and car park where we had cars waiting to take the councillors to the Millers Arms. There we were joined by Clive Reed, one of the founding members of the SCS in 1981 (and our current Heritage Consultant) and also by John Hutchings who worked on the Swansea Canal from 1954 to 1994. Over drinks, we showed the councillors the ‘Water Adds Value’ DVD which succinctly sums up the economic value of canal restoration. We are years away from the first sod being turned for this restoration but this was a wonderfully encouraging start. I must thank John Davies of the SCBT for puttng so much work into this event and also to John Gwalter (and the the landlady of the Millers Arms) for their enthusiastic co-operation in getting the DVD presentation up and running. Previous postButterflies and Dragonflies Walk: June 21st. Next postNew Stop Planks for Lower and Upper Trebanos Locks: 26.6.14.